Garden Acupuncture specializes in the treatment of allergies, which can improve everyday life for those who suffer from reactions from spring to summer. Garden Acupuncture specializes in the treatment of allergies, to ensure patients can enjoy their everyday life with the reduction or elimination of their symptoms. Garden Acupuncture specializes in the treatment of allergies, to ensure patients can enjoy their everyday life with the reduction of elimination of their symptoms. Instead of relying on antihistamines and other medicines to temporarily mask symptoms, Traditional Chinese Medicine, which includes acupuncture, helps retrain the body to have the appropriate balanced response with natural, holistic, and specialized treatment. Garden Acupuncture now specializes in the treatment of allergies, to ensure patients can enjoy their everyday life with the reduction or elimination of their symptoms. Acupuncture has the ability to modulate cytokines, which are immune system cell secretions, as well as the ability to induce anti-inflammatory actions. These two properties make acupuncture an effective tool in addressing allergies. Garden Acupuncture provides both in-office treatments and special herbal formulas for the treatment of allergies. Treatment can be started at any point during allergy season. If one is already experiencing allergy symptoms, treatments and herbal formulas can provide significant relief. Garden Acupuncture welcomes everyone to a unique healing option and are here to help guide any health concerns. If you are ready to start your journey to better health don't hesitate and book today. 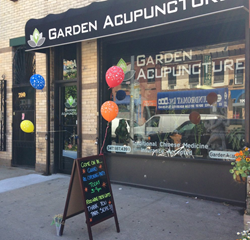 Garden Acupuncture is a family-run, small business in the heart of Park Slope. They pride themselves on individualized, affordable treatments and are committed to offering the best holistic care to the local community. They also accept insurance. Specializing in fertility medicine, weight loss, allergies, pediatrics, pelvic pain, fibromyalgia, stress, anxiety, sleep conditions, pain, and dermatology using acupuncture, Chinese herbal therapy and nutritional counseling.